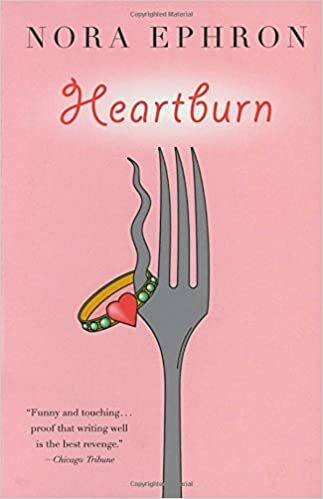 Heartburn – loudlatinlaughing – Euge! Euge! Nora Ephron’s book came up as an example of humorous women’s writing so I decided to take a break from serious reading to slurp this up in an afternoon. The narrator is a 7-month-pregnant woman who discovers her husband is having an affair and when she confronts him, he simply says that he loves the other woman. She flees DC for her native NYC, 2 year old child in tow, and tries to make sense of her life. Husband shows up a few days later, not contrite but asking her to come back. She does, and they hang on for a few more weeks, she has the baby early and discovers that he’s purchased an expensive necklace for the other woman while she was recovering from her C-section in the hospital. She sells her diamond ring for $15k and realizes she can walk out now, but not before she tosses a key lime pie in his face. It’s a mediocre book that’s heavy on recipes and light on subtle humor, but a good change from serious brainwork.